My coworker M wanted Guinness cupcakes for her birthday. After doing some searching through the interwebs & Pinterest, I gathered a few ideas and added my own to come up with a delectable cupcake. These cupcakes have booze in every layer, but it is not overpowering. Since we really don’t drink around here, I had to spend some $$ on making it happen. First stop: Liquor Store! 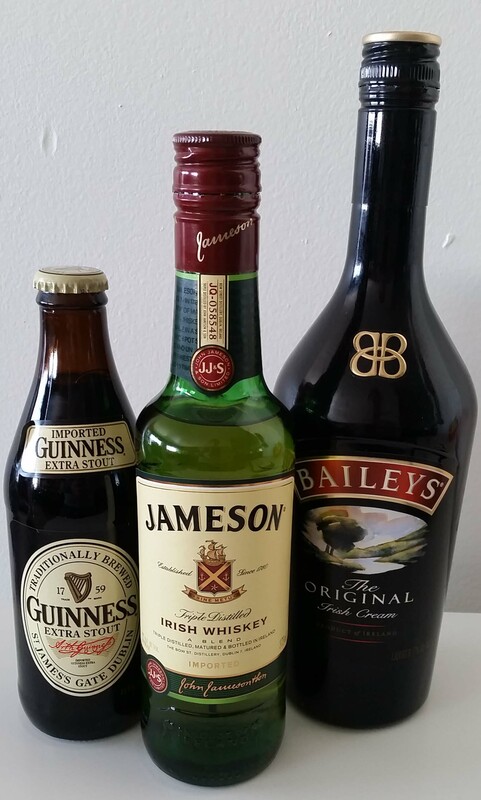 Here I bought I six pack of Guinness Extra Stout 12oz bottles, Bailey’s Irish Cream, and Jameson Irish Whiskey. Guinness for the cupcakes. 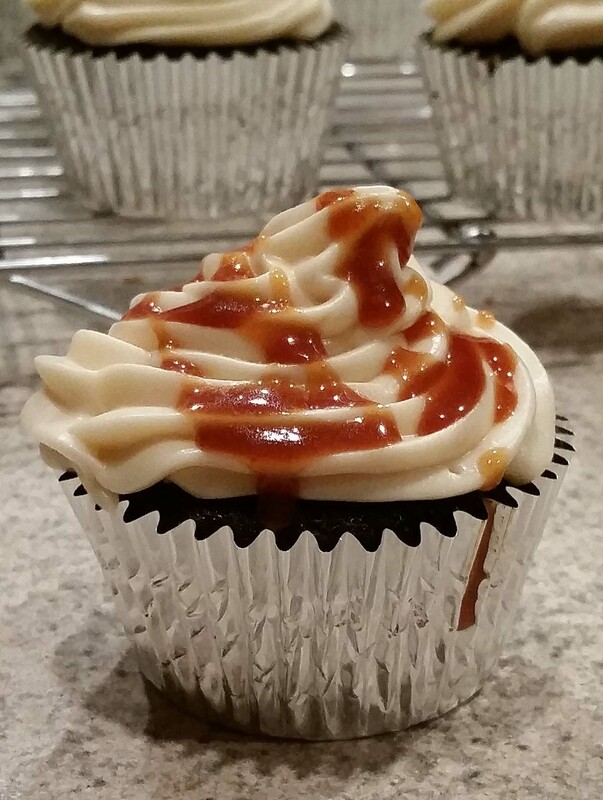 Bailey’s for the frosting, and Jameson for the caramel drizzle. 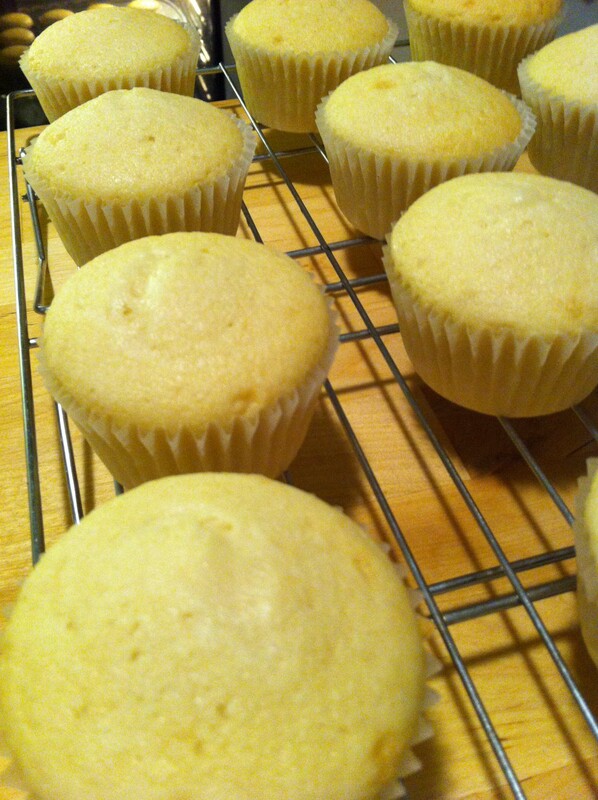 Prep your muffin tins with liners (or you can butter and flour them. Take a paper towel and softened butter – not the butter for your recipe – “dip” your paper towel in the butter, rub it on the inside of each muffin cup. After you have done this with each of the cups, take flour – not the flour for your recipe – sprinkle enough to coat the inside of each cup. Remove excess flour by turning the pan upside – over the sink or trash – and giving it a gentle tap with your hand). In a large bowl, combine flour, cocoa powder, baking soda, and salt. I’m not a sifter, so I whisk the ingredients, gently. In your stand mixer, using your paddle attachment on Speed 4 or 5 (medium speed), add butter and both sugars. Mix until light and fluffy. 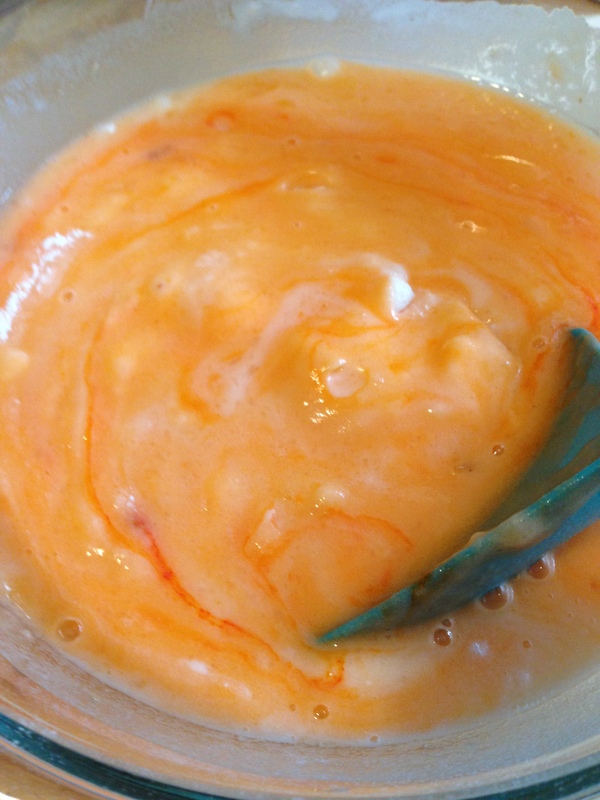 Add eggs, one at a time, making sure the mix stays fluffy in between eggs, and scrape the sides of your bowl down. Slowly add Guinness. It may look a bit separated and changes the beautiful fluff that you worked so hard to achieve, but it will come out great. Add the dry ingredients slowly, about a ½ cup at a time in order not to have a flour cloud going through your kitchen. Stop the mixer and scrape down the sides a few times to make sure all of the ingredients are fully incorporated. Divide the mix between the 18 muffin cups. I have a scoop that helps me get an even distribution, it’s about a ¼ cup. Bake at 350F/180C/Gas4 for 20 to 25 minutes or until a toothpick/cake tester comes out clean. Set on rack to completely cool before frosting. Fit piping bag with a tip and frost completely cooled cupcakes. In a heavy saucepan, over low heat, you are going to melt the sugar. Swirl it, don’t stir it. If you stir it, it will seize up on you and become a gross granulated mess. Continue to swirl until the melted sugar becomes a beautiful dark golden color. I found it took me about 5 minutes. Remove from heat and carefully pour the heavy cream into the sugar. You should stir constantly while pouring the cream. It will bubble and steam, and stirring it will help keep the cream from burning and will get it mixed in properly. 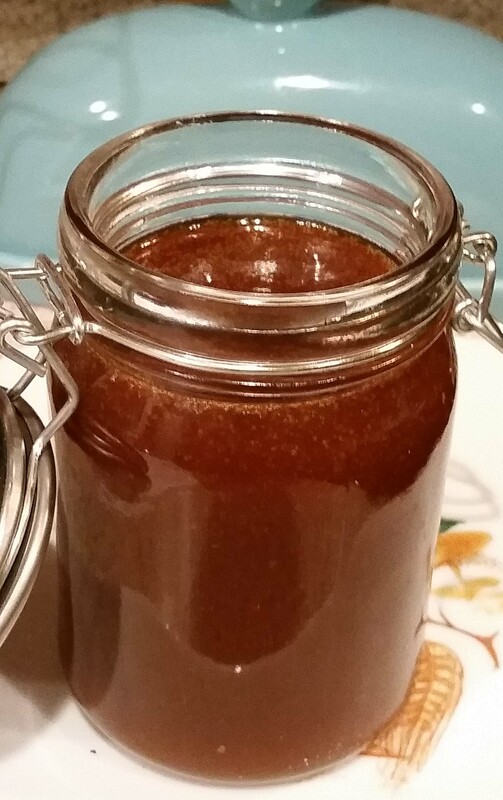 Return to low heat, continue to stir, if caramel has hardened, continue until it is dissolved, then add the butter. Continue until butter is incorporated. Remove from heat, slowly add Whiskey, and continue to stir while you are adding it. Let cool before drizzling it on top of your cupcakes. I ended up with a large amount of drizzle, compared to the amount I put on my cupcakes. Store in the refrigerator and bring to room temp to serve. I ended up serving it over vanilla ice cream – YUM! You can also add it to the top of brownies. This New Year’s I decided to make Mochi. 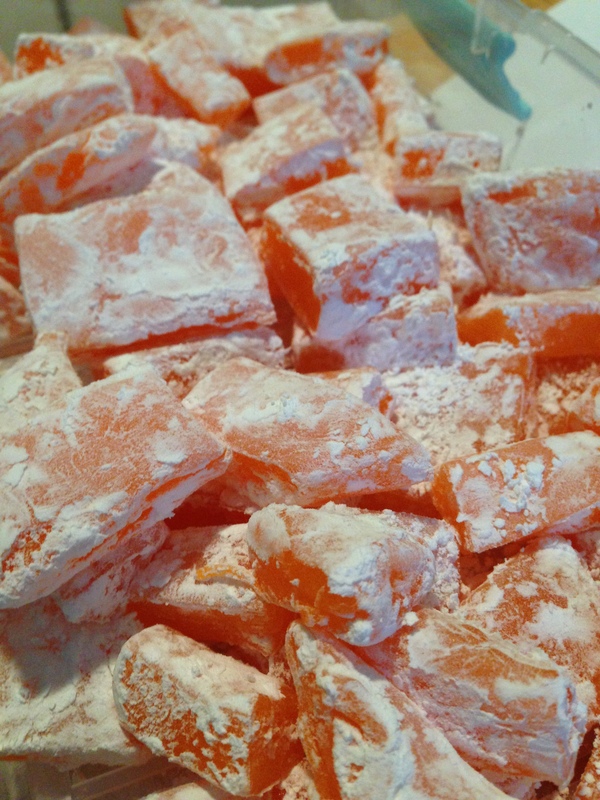 I did not make it to add to broth, but as a delicious candy. This is the second time I made it. The first time, I steamed them on the stove with homemade cranberry sauce inside. Those instructions will come later. This time, I tried the microwave method and were not filled with any extra yumminess. 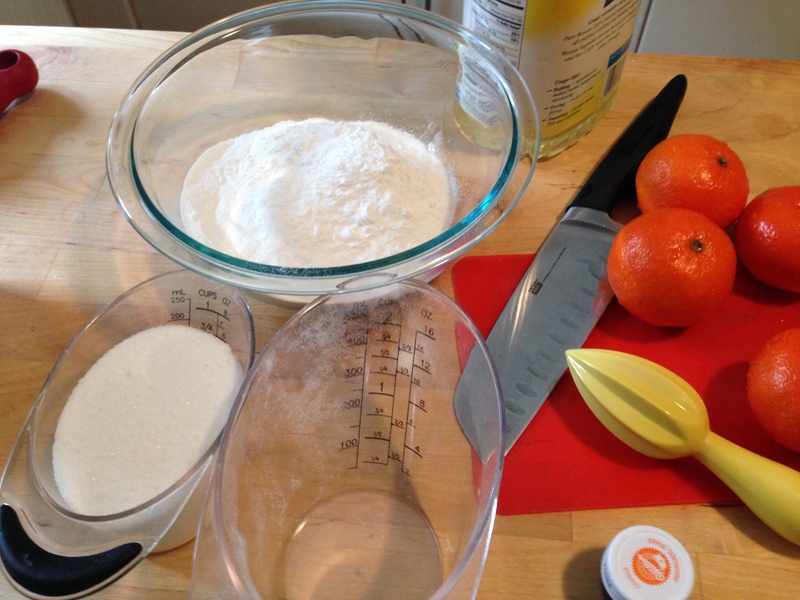 In a medium sized mixing bowl, combine dry ingredients (1 1/2 cup rice flour, 3/4 cup sugar). Add 1 1/2 cup of the liquid of your choice, drops of oil, and your food coloring. Mix well until it comes to the consistency of pancake batter. Cover with plastic wrap and put in microwave – mine took 8 minutes on high. Depending on your microwave you could have it in there anywhere from 6 to 10 minutes. After it is finished cooking, take out of microwave and let it cool. When it is cool enough to handle, dump it out on a plastic cutting board. As it cooled, I gently worked it into a large circle with the thickness that I wanted. I would leave it sit until it became easy to handle. Since the dusting contains powdered sugar, you will want it to really be cool enough as to not melt the powdered sugar. While I waited for it to cool, I combined the 2 ingredients for the dusting powder. After it has cooled, it is shaped to the the depth that I wanted, I pulled out the pizza cutter. Sometimes I had to dip the pizza cutter into the dusting powder in order for it not to stick while cutting the Mochi into squares. After I had cut the Mochi into squares I put them in the bowl of dusting powder, shook off the excess, and placed them in their container. Thanks to Little Red for the help, it went by real quick. It was really simple to make it and took next to no time at all. The longest part was waiting for it to cool down enough to handle. They turned out really yummy, however I would have like a bit more of an orange flavor. What is your favorite flavor of Mochi? The chaos of getting here was so worth it. 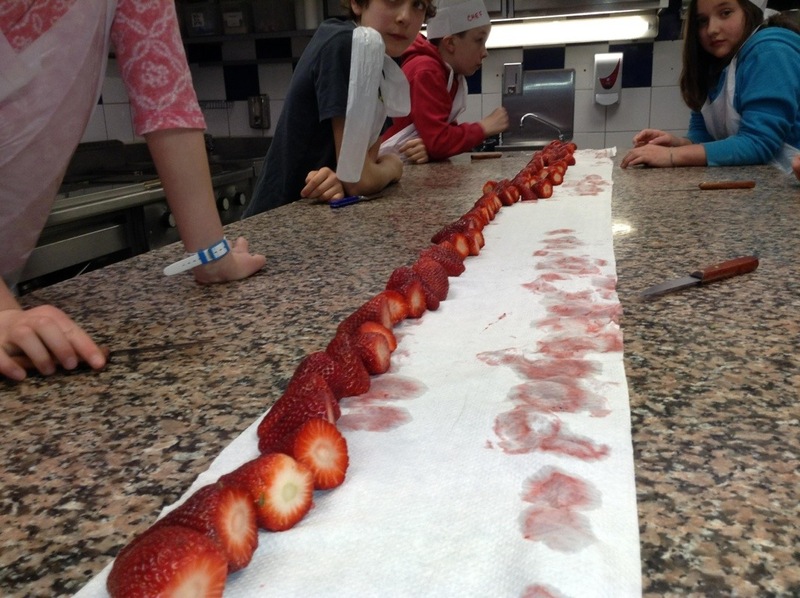 Little Red enjoyed her time at Le Cordon Bleu. The day started with her unsure if she really wanting to attend the class. She had concerns of being the only American or English speaker. I had let her know that the class has an English translator, so they must get enough English speakers to warrant a translator. She was then a bit unsure because she wasn’t going to know anyone. What do you know? A girl from her school walked in the door. The chef was amusing and worked really well with the children. 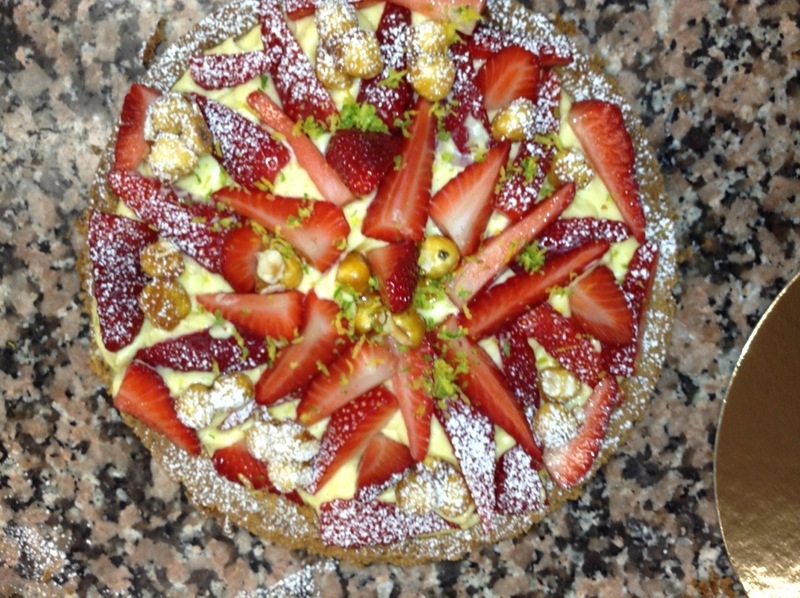 He taught them how to make this delicious looking tart. I haven’t tried it yet, I’m waiting for us to get it home tomorrow & share with the family. Some parents stayed and watched the whole class, I decided to let her explore and learn, without being a helicopter parent. I did take some pics at the beginning and end; she took the ones of the food below. Thank you LCB for offering Les Petits Cordons Bleus! 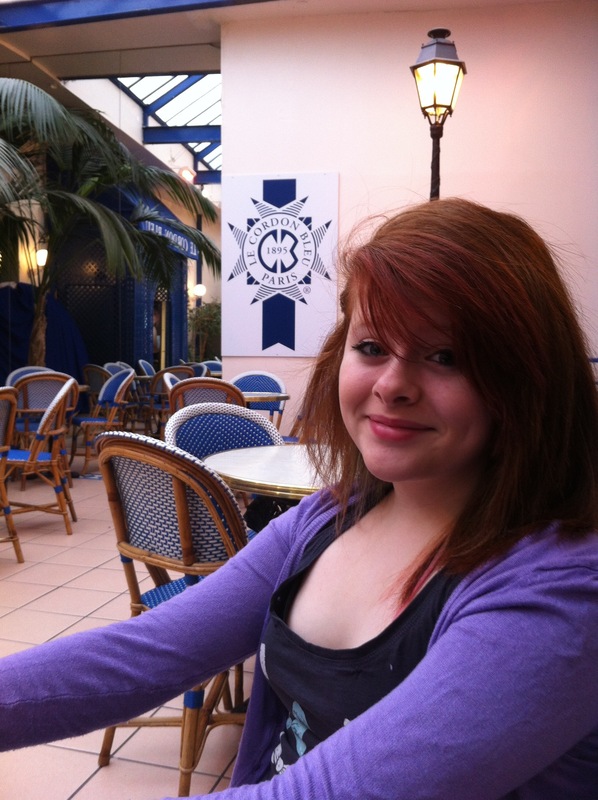 Now… If I could just get her to go explore Paris with me. A friend of mine asked me to make cupcakes for a baby shower she was hosting. I love to make cupcakes, so I said yes. The order was for 2 dozen cupcakes, themed for a baby girl. Living in Germany can present some challenges. Cupcakes are not quite as a big deal here as they are in the States. Therefore, procuring supplies can sometimes be a challenge. 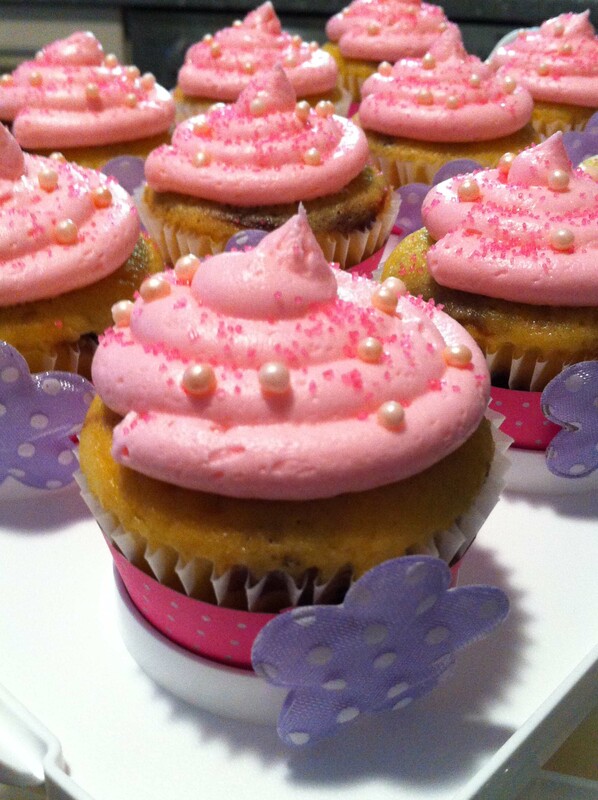 I had some various pink cupcake liners that I had brought back from D.C., but they were not what she wanted. She had seen some purple with polka dots liners at a “Euro” store, but when I was able to get there a couple of days later, they were nowhere to be found. We agreed that maybe we should just do white liners. I think white liners can be boring, so I knew I was going to have to dress up the cupcakes. Please excuse the quality of the following pictures, I took them with my phone. 2 flavors were chosen – Vanilla and Marble. 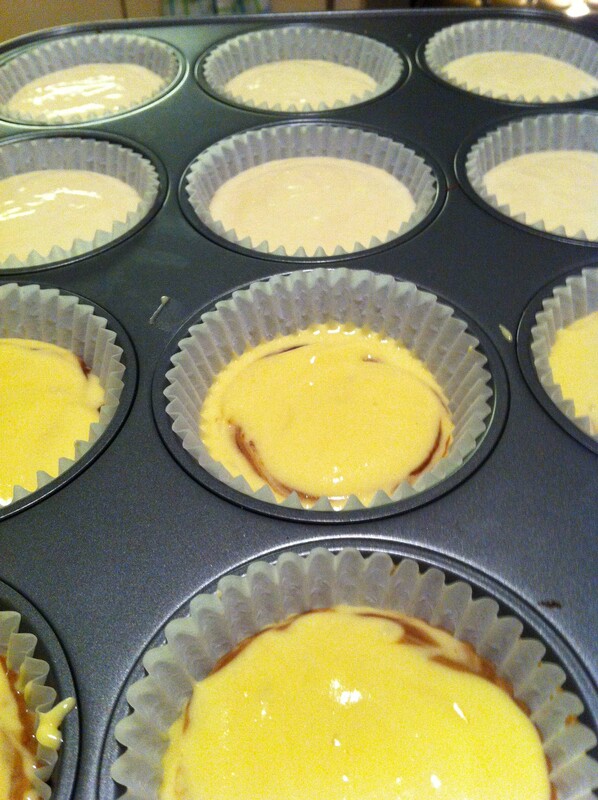 I like to do a marble cake instead of chocolate or red velvet when I am using white liners. I am able to keep the majority of the dark colored cake in the middle, leaving the outside a light or white coloring. 2 colors were chosen – pink & purple (more of a lavender). No problem, I have food coloring and I can mix it accordingly, if I don’t have the correct color. I was given the choice of frosting flavor. Here is what I came up with (forgive the pics, I was going to take final pics when we had set up the display, more on that later). After baking the cupcakes and looking at them, they looked okay. A bit on the boring side, but okay. I was not happy with how plain they were looking, so I had to come up with a plan. I took out one of my cupcake wraps (you know the kind that cost more than you want to pay to wrap around a cupcake). 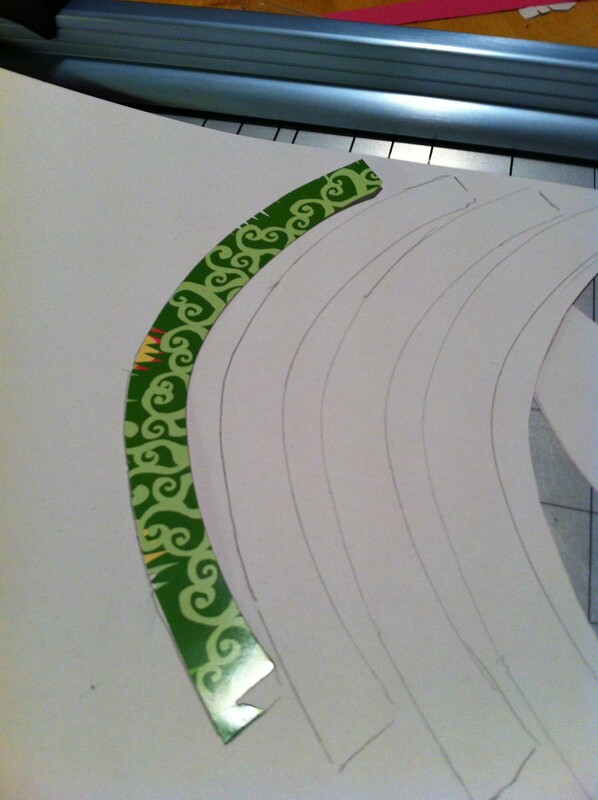 I trimmed it (I can use it again), got some scrapbook paper, traced the forms, and trimmed my new “wraps”. That was good, but I needed a little more. 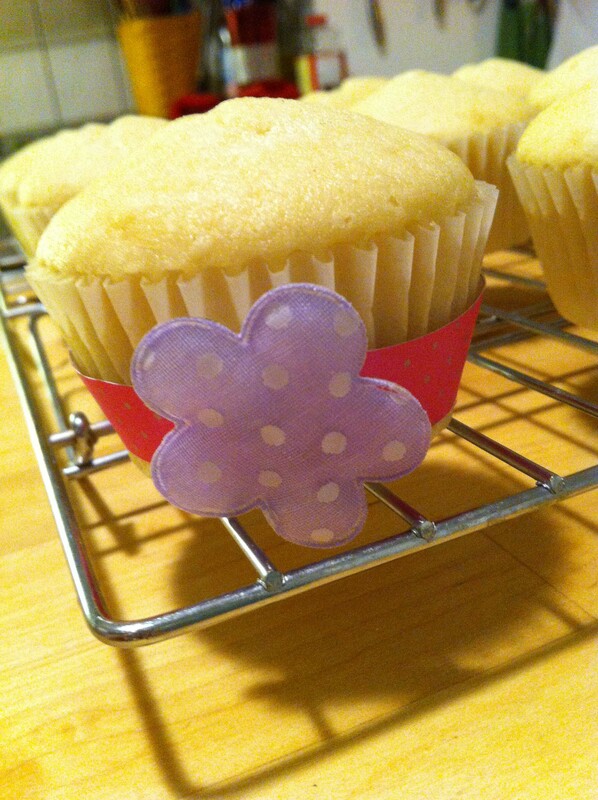 I found some flower stickers at a local store and added those to the cupcakes. 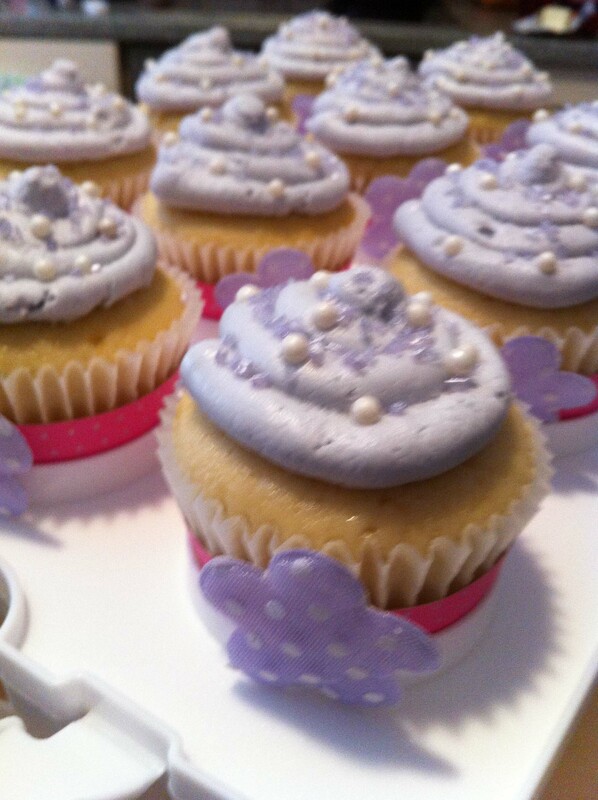 They were lavender with polka dots, I was hoping that would fit the bill with the lack of colored cupcake liners. They are starting to get there! Next I needed to make the frosting. I thought about doing a vanilla sugar frosting for both. Then I thought, why do we want Vanilla on Vanilla. No way! 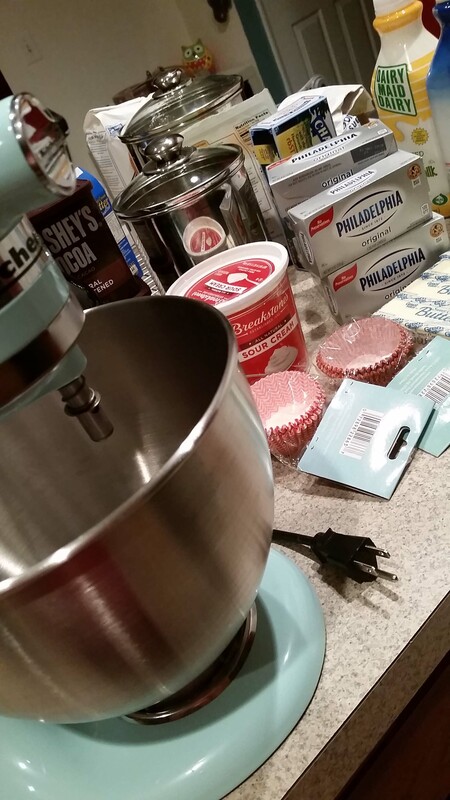 Let’s do Lavender Vanilla frosting on the French Vanilla cupcakes. Now, I had to figure out how to make the lavender flavor. In my sugar frosting recipe, I tend to use heavy cream, so I took about 1/2 cup of heavy cream, put my lavender flowers in a tea bag (I ended up using 3 tablespoons…. way too many – not bad, just a little stronger flavor than I would have liked. 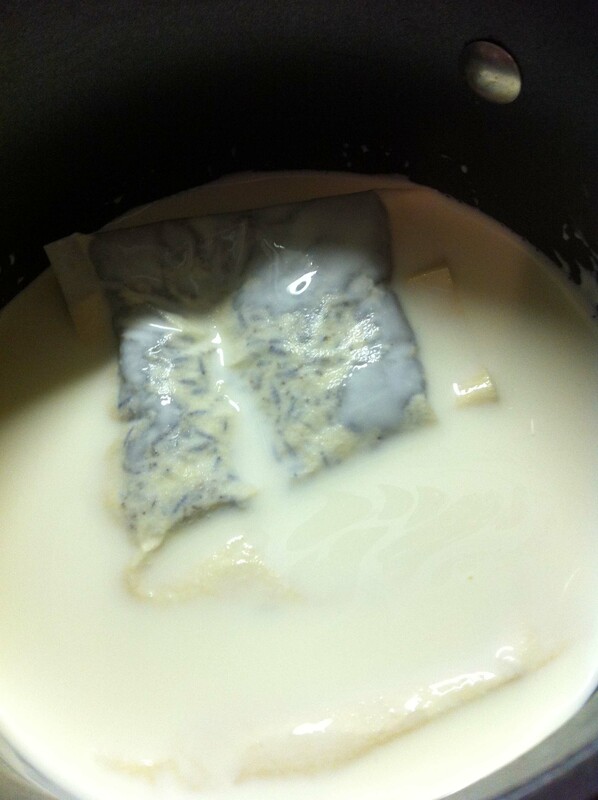 Next time I will try 1 tablespoon), heating up the cream and tea bag (be careful, milk products can easily scorch on the stove), and then letting it steep. I added the Lavender Creme to the frosting concoction, added a drop of red and a drop of blue food coloring to make the frosting Lavender. I added a little vanilla extract to the mix (after all, it was supposed to be a lavender vanilla frosting). The next batch of frosting was going to be pink. I wanted a little flavor to that, so I added some strawberry flavoring to the mix and a little bit of pink food coloring. Now, remember when I said I was going to take a picture of the cupcakes on display? They never got that far, they are currently sitting in my refrigerator. Why? Well, as I was about to start frosting the lavender cupcakes, I got a text from my friend JW (the person hosting the party). The mommy-to-be became a mommy that morning. UGH! I could have delivered the cupcakes to her and let her freeze them for the rescheduled party (one or two weeks away), but I know her freezer is probably about the size of mine. We have German sized freezers, which means TINY. I also don’t feel the quality of the cupcake would have lasted. I refuse to have people eat a cupcake that is not up to my standards. So, it looks as though Barefoot Runner and I will be taking cupcakes in to work tomorrow to share with our lucky co-workers. I will happily make her a new set of cupcakes at a later date.